I knew on Sunday it was going to be one of those weeks. You know the type – the kind that fly by, with a million and one things to do and not enough time to do it in. By today, my “to-do” list is already full of things yet undone, only to be replaced by other tasks. If cloning were an option I would seriously consider it. I take 2 big boxes of low sodium chicken broth (or veggie broth depending on my mood). I use up all the veggies I have on hand, throw some garlic powder, lemon juice and a little almond milk in to make it more “creamy” and salt and pepper and let the veggies simmer for about 40 minutes. I then puree the whole batch and… Voila – a delish lunch or dinner! But last Sunday I wanted to find a way to shake things up a bit, and was just craving chicken soup. 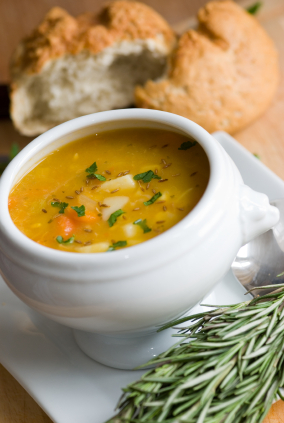 Chicken soup is a perennial favorite of mine, especially when I’m feeling under the weather. In fact, researchers at the University of Nebraska have found that chicken soup may help reduce upper respiratory cold symptoms. Chicken meat also has antiviral properties. But beyond it’s scientifically proven effects, it’s just good old fashioned comfort food. So I was perusing my grocery store for some chicken soup that wasn’t full of sodium – which is surprisingly difficult! Most of the stuff I found had questionable ingredients and 800 plus mg of sodium per cup! That’s almost half the amount of sodium you should eat per day. So I decided rather than taking my chances on the bottled stuff (and potentially swelling up like a balloon in the process! ), I was going to make it. But needless to say, I’m not Julia Child. I do not have time to roast a chicken, make homemade chicken stock from its bones and decorate the whole things with rosemary sprigs. So I took the easy way out and here is my recipe! Simmer the carrots, celery, and chicken in the stock for 20 minutes. Add the broccoli and zucchini for another 10 minutes. Add parsley, garlic powder, and salt. Eat it up!